Now that the leadership spill is official, splashed over tabloids and news websites for the next five days, the Federal Liberal Party will have no choice but to replace Abbott, unless it wishes for electoral oblivion in 2016. Now that the leadership genie is out of the bottle, it will be impossible to put it back in. If Abbott does survive Tuesday’s spill, the question will rightly be asked: how can he govern with any authority when there is so much consternation on his backbench? Australian voters are being subjected to a political groundhog day. In 2013, it was Rudd and Gillard going at it. Gillard survived the first botched spill in February, but that didn’t save her Prime Ministership from its inevitable demise. So it will be with Abbott. If he wins on Tuesday, the attempts at destabilisation won’t stop. The polls will only worsen, as the public are now fully aware that many in his own team believe that he’s not the best person to lead the country. His authority as Prime Minister is in tatters. So if it’s not next week, it will be some time shortly after. There’s little wonder why Labor Party members around the country are praying for an Abbott victory on Tuesday – the only time they will ever support him. It’s because they know that from here, his presence in the PM’s office is electoral poison for the Liberal Party. The worst case scenario for Labor and Bill Shorten is Turnbull at the helm. He’s a moderate, centrist politician that will, by his very presence, win back many voters in the middle and even potentially snag some support from the Left. As far as Labor are concerned, Abbott is their greatest ally. Abbott is currently the Federal Liberal Party’s fourth longest serving leader, behind Menzies, Howard, and Fraser. A removal will not have been in haste. When Rudd was unceremoniously dumped by Labor in 2010, the public didn’t see it coming. Many woke up the next morning completely shocked to learn that the nation had a new Prime Minister. The reason for Rudd’s removal was never made clear to voters. 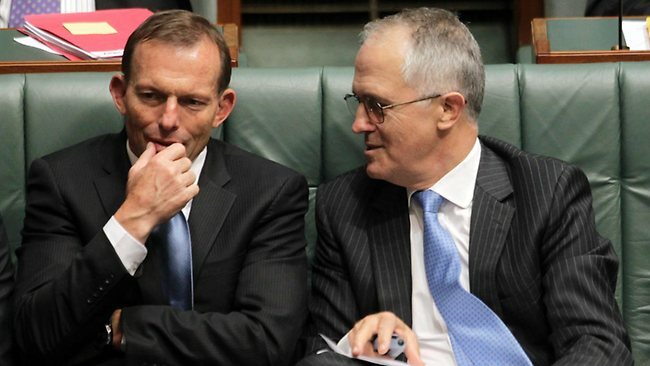 If Abbott is removed, it will come as little surprise to many. Further to the previous point, if Abbott is removed, it’s difficult to imagine many in the electorate mourning the loss. Abbott, unlike Rudd in 2010, is not a popular leader. Rudd still had a 52% approval rating when he was removed. Abbott is languishing at 27%. The general public have, in numerous polls, indicated their desire for Turnbull to be leader. When Gillard took over from Rudd, there was no groundswell of established support already there. The Labor Party, particularly whilst led by Bill Shorten, could not possibly, with any credibility whatsoever, criticise any change of leadership. It might not look pretty, but the Liberals could easily blunt any attack from the man who has knifed two prime ministers already. Liberal Party members might worry themselves with repeating Labor’s antics, but they need not be concerned. This situation is different. If Abbott remains as leader, that is when the disaster story will play out. The leadership questions will continue, and the instability that plagued Labor will be worn by the Liberals every day until voters go to the polls. It will be a wipe out. A switch to Turnbull is the best way forward. It will give the party a chance to reboot and refocus its key policy priorities. Turnbull is highly intelligent, articulate, and moderate. The Liberal Party should, and must, place its faith in him next Tuesday. If Turnbull becomes leader they’ll be a fighting chance. Abbott is a lame-duck after only 15 months. Turnbull’s challenge will be taking the party with him. Is it so much to ask that Australia has at least two years of stable leadership? I have never voted liberal but there’s a part of me that actually misses John Howard. I suspect you’re not the only one feeling some nolstagia for Howard. This country misses stable leadership.